ROBO-ONE 26th sponsored by Biped Robot Association, took place at Amyu-Atsugi in Atsugi City, Kanagawa Pref. on Mar 14th and 15th, 2015. ROBO-ONE Light 10th took place on Feb 14th, 4.5m Footrace took place as the preliminary ROBO-ONE Tournament on Sep 14th and the main event ROBO-ONE 26th Final Tournament took place on Sep 15th. ROBO-ONE Light is a robot fight tournament for robots on the market, which are officially recognized by ROBO-ONE Committee. Beginner, who gets robot from the market and want to attend the ROBO-ONE Tournament, also can attend the competition with his robot which is made from just robot kit. 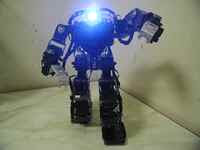 Custom-built robot, just the weight 1 kg or under (UK1) also can attend the tournament. Robots on the market, officially recognized by ROBO-ONE Committee, can attend the competition whether the robot adapt ROBO-ONE Light 10th regulation nor not. Remodeling is prohibited. Head parts can be remodeled and also covering robot body with plastic or paper is permitted. 2) Robot weight except for the officially recognized robot is 1 kg or under (UK1) and the robot has to adapt ROBO-ONE 26th regulation. Seventy-two robots joined the 10th tournament. The half of the robots joined were officially recognized robots such as KHR-3HV, DARwIn-mini and the half were custom-built robots UK1 (1kg or under). Custom-built UK1 robots could overcome the weight handicap 500g. The Champion was Simplefighter Light by Zeno, the 2nd place was Worst Juraru Queen by Daido University Robot Research Club and the 3rd place was Rhapsody by Kobe Science Technological High School. The results are here. All videos of ROBO-ONE Light 10th were uploaded to YouTube Channel by Ritsumeikan University Robot Technology Research Club. 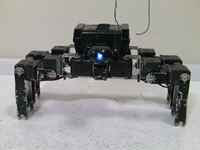 Biped Robot Association also uploaded videos of the 10th to YouTube ROBO-ONE Channel. Sanzai-san reported the details of the 10th in his blog (in Japanese). ROBO-ONE Light 1st took place on Mar 20, 2010, ROBO-ONE Light 2nd on May 22, 2010, ROBO-ONE Light 3rd on Oct 8, 2011 ROBO-ONE Light 4th on Mar 24, 2012 and ROBO-ONE Light 5th on Sep 1, 2012. The details were reported in this blog. Hello. I am Goh. From Malaysia. I would like to ask you about the humanoid robot. May I know which type of robot that Japanese using in Robot fighting competition? I can saw a lot of aluminium frame robot in competition. But when I online searching, there are only some plastic frame humanoid robot for sales. Is it the aluminium frame robot is customized by the owner?